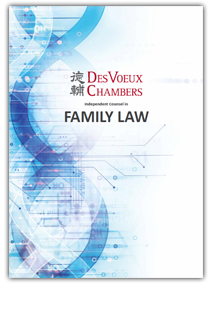 Chambers has a strong grounding in family law. Our set has catered to clients in divorce and separation cases, many prominent, as well as matrimonial settlements. Many cases are multi-jurisdictional and we have recently played a major role in litigation in Australia, New Zealand, Germany, and Singapore. Winning plaudits for “see[ing] the big picture” and “addressing matters holistically” this junior is also acclaimed as being “very experienced and for being a great practitioner” in the financial and child-related sectors within the Family law arena. “Fight[ing] her corner particularly tenaciously,” this junior is respected for her work in family matters “operating in both the financial and custody spaces, her expertise covering nuptial settlements, ancillary relief and third-party interests.” She is best known for her work where the interests of children are concerned. Characterised as being a very experienced practitioner who is popular among family law solicitors, one of DVC's members is well-known for "being able to address all different aspects" of family law and for being able to "operate across the family spectrum for financial and child-related issues." Another member "devotes her entire practice to family law matters covering all branches of the discipline," and is respected for being "one of the most experienced handlers of children's matters."